Along with his intrepid companions, Dale Arden and the brilliant Dr. Zarkov, Flash Gordon is off on his most deadly mission...an epic science fiction adventure in the boldest and best tradition of the genre. The deadly menace of Ming the Merciless, the cruel, murderous master of the alien world Mongo, casts his evil shadow across the universe. And only one man can halt the spread of his incomparable lust for dominance. 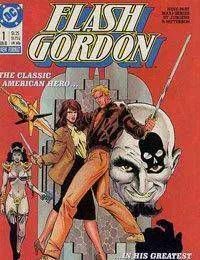 That one man is Flash Gordon.